On phase 1 you will cook to unwind stress and support your adrenals with nourishing breakfasts like Strawberry Pancakes, as well as delicious entrees like the Mediterranean Turkey with Wild Rice. Full of helpful and affordable hints for cooking on each of the three phases, a wealth of freezer-friendly recipes to cook in bulk, and dozens of slow cooker options that can be prepared in under 5 minutes, this is the ideal tool for the busy mom, the on-the-go professional, or anyone who wants to make delicious, nutritious, home-cooked food part of his or her Fast Metabolism lifestyle. 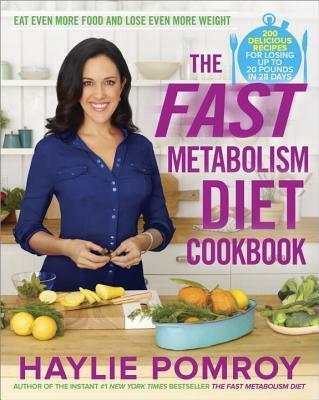 #1 New York Times Bestselling author Haylie Pomroy is well known in Hollywood and in the medical community for her ability to effect rapid weight loss by using food to jump-start the metabolism. With Integrative Health Care Clinics in Beverly Hills, Burbank, Irvine, and Fort Collins, her celebrity clients include Jennifer Lopez, LL Cool J, Robert Downey Jr., Reese Witherspoon, and NFL athletes. She has appeared on Doctor Oz, Good Morning America, Katie Couric, EXTRA TV, Access Hollywood, and been featured in First for Women, People Magazine, Harper’s Bazaar, Marie Clair, New Beauty, and more.